So my intention is to undertake a journey along this fifty-one-and-a-halfth parallel, the line of latitude also known as 51.5°N or 51°30'N. I'm not walking it, not least because this particular line crosses the Thames as many as six times, and only one of these has a bridge. But I will be stopping off at numerous locations which happen to lie precisely on this imaginary line, i.e. exactly 103 one-hundred-and-eightieths of the angular distance between the equator and the North Pole. 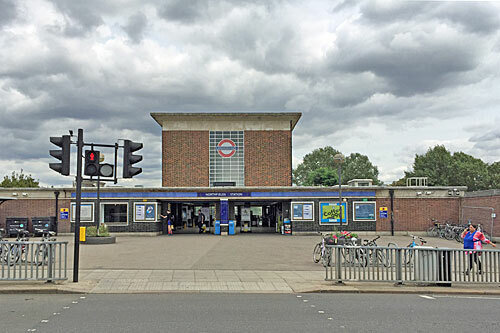 Because this is essentially a random east-west line, it traverses some utterly mundane parts of London and just misses several places of genuine interest. But sometimes the mundane bits can be the most fascinating, and don't worry, there are some amazing direct hits along the way. I'll be starting out east, on the edge of Thurrock, and crossing at least a dozen London boroughs on my way to the river Colne in almost-Buckinghamshire, thirty-one miles later. Bang, right at the very edge of the capital we have a direct hit on a major road junction. I'm standing above the A13 dual carriageway, on a bridge between two feeder roundabouts, amid a Ballardian landscape of marshland and central reservations. 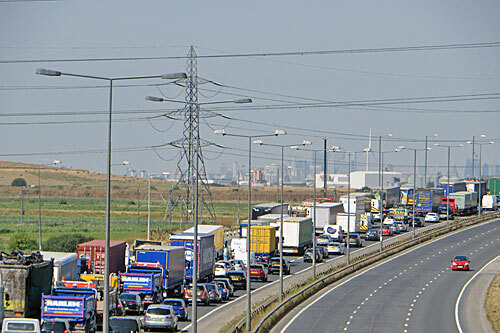 Immediately to the east the A13 passes into Thurrock, and sweeps round towards M25 J30, where the London orbital makes a break for the QE2 Bridge. And to the west the A13 rises up onto the Wennington Viaduct, which is currently paralysed by a three mile tailback caused by an accident involving a spillage of Coca-Cola cans somewhere near Barking. I'll be heading into London long before any of the poor bastards down there. The dominance of road transport in this location is astounding. 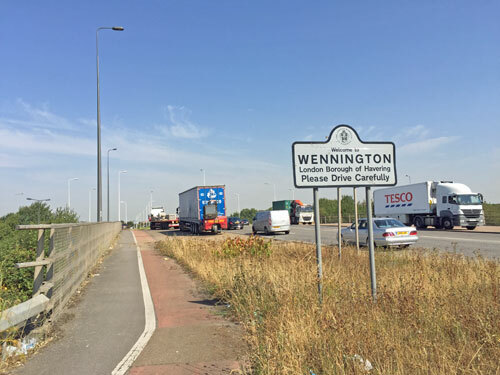 The roads are busy, obviously, but so are the pavements from parked-up lorries seeking a space to rest, including several on the bridge itself. What's more, all the local businesses are auto-related in some way, including a significant cluster of car dealers just beyond the slip road to the north. Whether you're after a £30K BMW or a sub-thousand runaround, the Essex Car Company or the grimly-named Car Realm have a guaranteed finance deal for you. Here too are Rainham Motor Caravans, and the greasy breakfast hub of Noakes Kebab and Burger, and the engine-tweakers at Track N Road Powerformance. Passing through on foot I felt borderline unworthy. 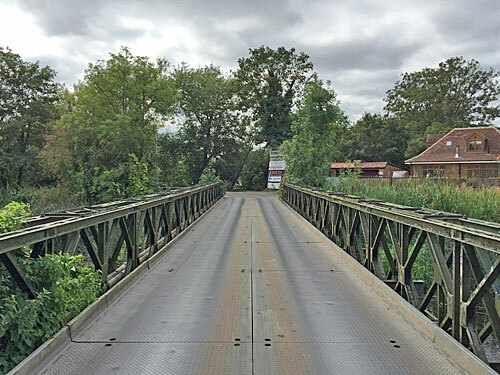 Unsurprisingly the bridgetop is scattered with litter, from bleached crisp packets to empty bottles of Lucozade chucked from the cab. A single white butterfly flits between the detritus, pauses awhile on some concrete crushed beneath the front wheel of a Tesco delivery lorry, then flies away. A motorcycle cop watches over the entrance slip on the Thurrock side of the border, advising traffic it may not want to join the logjam below. And I am strangely heartened by the skyline of central London being plainly visible on the horizon, behind the lampposts, pylons and a giant rotating wind turbine. How fortuitous that the precise alignment of a line on a map should afford such a perfect view of the journey yet to come. It's not possible to stand on the 51½th parallel for the next mile and a half, because not a single road or public footpath cuts across. First it's dual carriageway, then a tiny wedge of fenced-off fields, then the High Speed One railway line dividing the wetland landscape as it speeds Kentward. On the other side of the tracks are the Rainham Marshes, but these are the private parts the boardwalks of the RSPB reserve never reach, so only birds and other wildlife are allowed inside. Welcome to one of London's least hospitable thoroughfares. 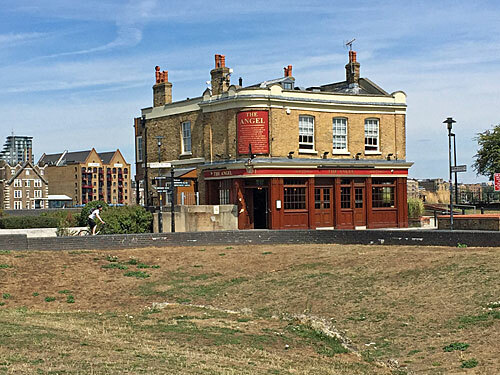 Coldharbour Lane started out as a track across the marshes to serve sheepfolds and firing ranges, and links the foot of Ferry Lane in Rainham to the Thames foreshore near Purfleet. It's long and initially perfectly straight, and a useful if unlikely shortcut if you don't want to follow the bleak estuarine footpath via Coldharbour Point. Alas Coldharbour Lane is even worse for sightseeing purposes, as it doesn't have a view, and is accompanied by a relentless procession of rumbling lorries. These juggernauts and tipper trucks are on their way to the Freightmaster Estate, a seriously remote riverfront corral where pallets are stacked, road sweepings reprocessed and goods of all kinds stashed for safe keeping. Many of the vehicles crawling by are emblazoned with wholly generic company names, like General Express Services or Economic Waste Management, while others represent inconsequential empires run by two-bit scrap entrepreneurs. This truly is a side of London you never see unless you work here. I thought I was going to have to follow the traffic, past a shuttered sentry box labelled Smile, You're on CCTV, but thankfully there's a separate footpath to one side. 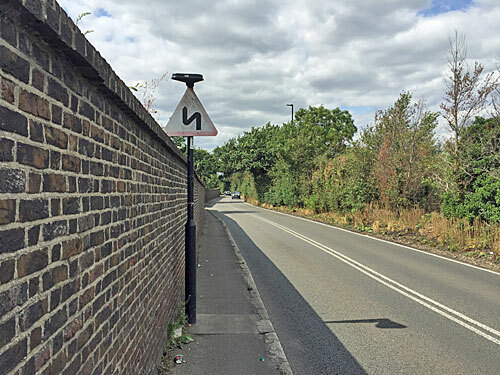 This squeezes between barriers to deter motorcyclists, ducks beneath a overhead pipeline and heads bleakly ahead with no escape for the next mile. Thankfully I only have to go a fraction of that distance before reaching 51½°N, a point which my GPS also informs me is two metres below sea level. I'm prevented from switching to the road by a reedy ditch (Steep bank! Soft Mud! ), and from trespassing elsewhere by an interminable bank covered with brambles, nettles, convolvulus and hawthorn bushes. Somewhere over the other side is an enormous Veolia landfill site, and quite possibly decades of your discarded trash. And all along the side of the path are red posts marking the presence of stumpy vertical pipes, their caps padlocked and numbered, restraining any gassy discharge within. Out of sight, out of mind. 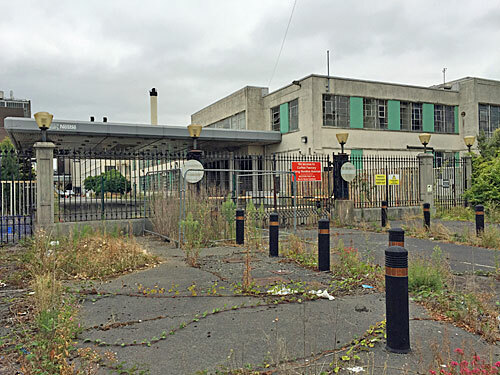 The only other point where you can stand on the 51½th line of latitude in Havering is immediately alongside the Thames, at the very tip of Rainham's riverside industrial estate. 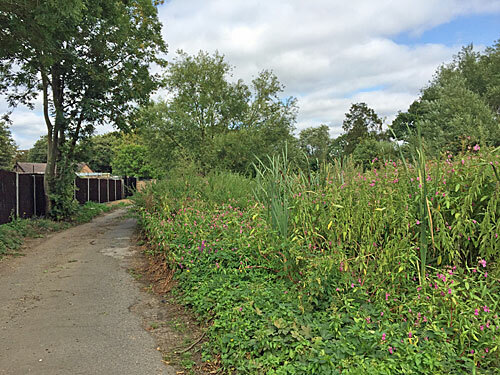 You'll know the spot if (and probably only if) you've walked the final section of the London Loop - it's where a scrappy footpath escapes from beneath the concrete wall around the Tilda Rice factory and emerges beside a muddy bay filled with peculiar treasures. There's also a tiny car park, for pensioners who want to drive to the edge of beyond and sit in their vehicles whilst staring across the ditchwater estuary towards Erith. It is simultaneously an abominable and an amazing place. 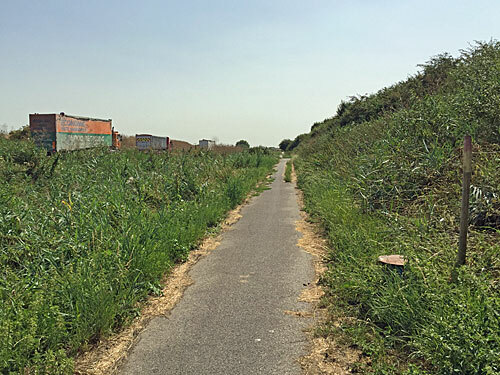 The precise spot I'm trying to find is marked by a wooden signpost pointing to Coldharbour Point, and a graffitied council information board confirming that one day the footpath will extend further to Purfleet... which it did in 2009. The tide has dumped chunks of polystyrene, packaging and plastic on the foreshore, while unseen humans have added lager cans to the mix. Hundreds of seagulls have perched along the metal jetty, and launch off sequentially with a choreographed flourish as I approach. Some settle on the dozen concrete barges dumped here in 1953, now silently rotting at a variety of attractive angles, and which rumour has it took part in the D Day assault. The other other-worldly structure is The Diver, a skeletal sculpture of the perfect height to be covered and uncovered by the tide twice a day. Lovers of oddball London should make a beeline here post haste. I can see my next destination on the other side of the river amid the silos and chimneys of the Belvedere Industrial Estate. But I can't get there direct, not since the medieval ferry from Coldharbour to Erith was closed down in the 19th century. I fire up Citymapper, for a laugh, which informs me it's a 5 hour walk via the Woolwich Ferry, or at best a two hour journey by rail. What's more they're right, the train journey to Belvedere taking just 48 minutes, hugely prolonged by the schlepp I now have to make back across the marshes to Rainham station. One thing about the Thames in outer East London is quite how much low-level commercial activity there is. The river is wide enough for 'neighbours' on the opposite bank not to be disturbed, so all the essential mucky infrastructure which keeps the capital ticking over is sprawled out across huge expanses of former marshland. The Belvedere Industrial Estate is a case in point, covering an approximately triangular slice on an inside bend between the Erith Oil Works and the Crossness sewage plant. 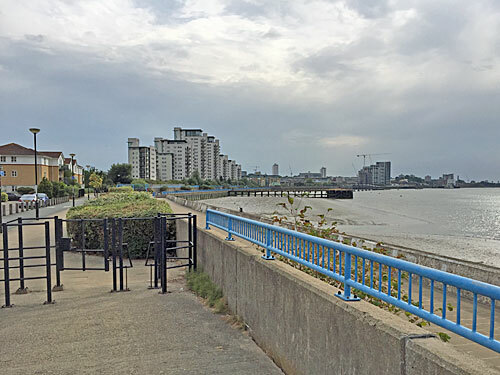 My target is one particular jetty south of Jenningtree Point, which despite being on the Thames Path is annoyingly hard to reach as the estate permits no river access except at either end. I climb up to the top of the concrete battlements, then weave round thickly grooved muddy beaches to the rear of sheds and depots, until I'm finally opposite where I was two hours before. Here at Mulberry Wharf I find a rare gate in the river defences, painted with yellow and black chevrons, firmly shut and overseen by CCTV and spotlights. Behind the iron bars sit maintenance trucks, caravans and a man in a forklift surrounded by pallets, while a thin pipe bends over the footpath to feed the padlocked jetty. This is T-shaped and mostly concrete, although one arm consists of two metal gantries to nowhere, linked via a central pillar. 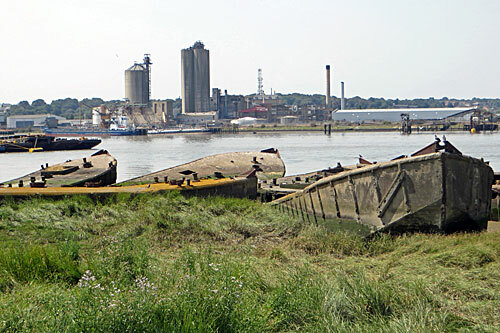 The surface is crumbly and overgrown, the only signs of activity being a rusty hopper connected up to a blue tube, and a couple of bright orange lifebelt holders, at least one of which is empty. Buddleia overspills the path. A cyclist careers by. The tide is sludge-low. 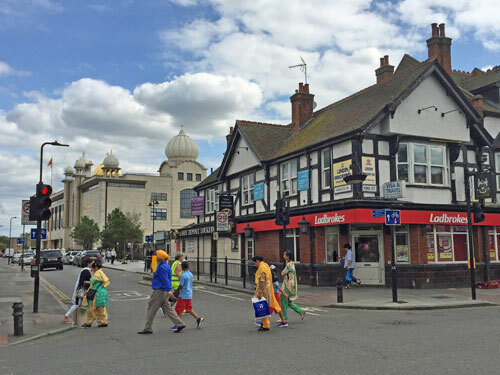 The top corner of Bexley, where land is cheap, has proven the ideal location for numerous logistics hubs and Customer Fulfilment Centres. Lidl dispense your shopping orders from a huge depot backing onto the river, Amazon distribute from a site on Crabtree Manorway, Tesco's Dotcom Centre is a bit nearer Erith, and Ocado have by far the most gigantic warehouse of all. 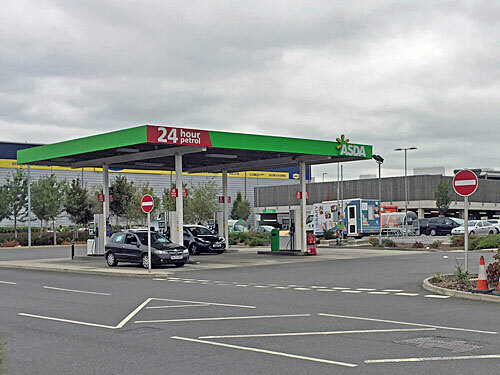 As for Asda's CDC, their white fortresses lie slap bang across 51½°N on Norman Road, and that's where I'm heading next. A large portion of the Erith Marshes remain somehow undeveloped, including this 60 acre site to the east of the Crossness sewage works. 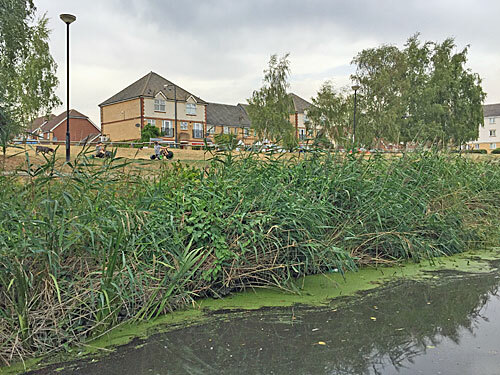 A rare reedbed haven, it's half private courtesy of Thames Water, and half accessible via an unpromising footpath link from Norman Road. A minute up the track I disturb a heron at close quarters amid the rushes, which flies off majestically followed by several startled waterfowl. 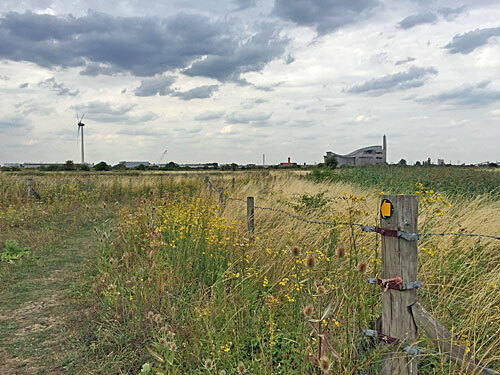 I soon find myself in the middle of a scrappy field grazed by shaggy horses, who eye me up from a safe distance, while the Bexley Incinerator dominates the near horizon and thistledown drifts across a barbed wire fence. I feel distinctly uncomfortable, rather than at one with nature, and retreat from the field just before a man with a van drives in and greets me with a suspicious smile. 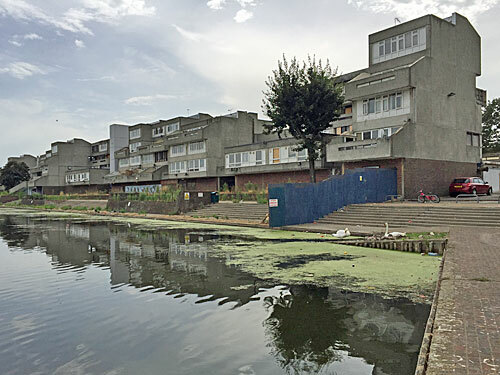 Most of Thamesmead is relentless housing estate, or empty, but I've hit the jackpot and arrived at its most famous landscape feature, South Mere lake. This is where C4's Misfits was filmed, and Beautiful Thing, and a particularly dystopian Stanley Kubrick classic. To the east of the lake is Southmere Park, littered with goose-droppings and abandoned barbecues by the water's edge, but increasingly bleak and paddocky on the extensive flatlands beyond. It seems a minor planning miracle that nobody's covered this underused recreational wilderness with a thousand homes, and equally remarkable that the 51½°N line of latitude has yet to hit a single residential building, even four miles inside the capital. We're about to change that. 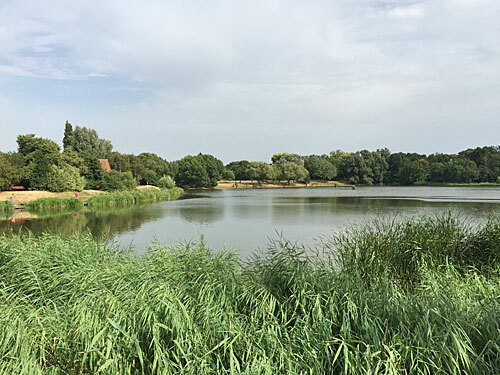 Binsey Walk was the location of one of A Clockwork Orange's most famous scenes, as Alex and his droogs strut along the edge of Southmere Lake before being booted, submerged and sliced. A single row of flats with staggered concrete balconies overlooks a stepped waterside promenade, where any 21st century hoodlum could don a bowler hat and codpiece and... oh hang on, it's been fenced off! A blue hoarding juts out just far enough to prevent even acrobatic access, while the swans brooding on the overgrown promenade suggest that this is no recent development. Another film location bites the dust. These famous flats, along with the majority of the original Tavy Bridge neighbourhood, are being demolished and rebuilt in modern vernacular. The shopping parade is part of Phase I, where wealthier incomers will get the waterfront block while denser affordable apartments are packed in behind (including ground floor homes for the first time following the relaxation of flood-risk regulations). 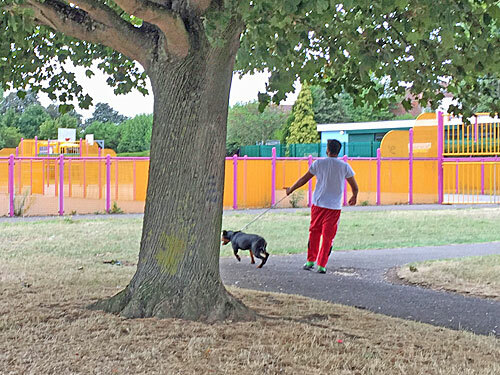 Binsey Walk is scheduled for later, but has already been decanted, with access to its upper walkways permanently blocked and several of its net-curtained windows either smashed or boarded up. 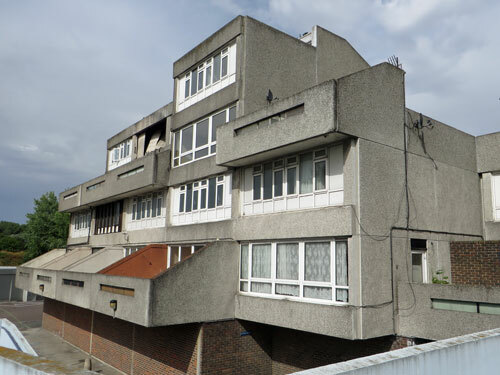 It should be good news for the 'temporary' portakabin library and the gutted Lakeside social centre, but what's planned is a strip of identikit buildings no location scout would ever pick for a movie. 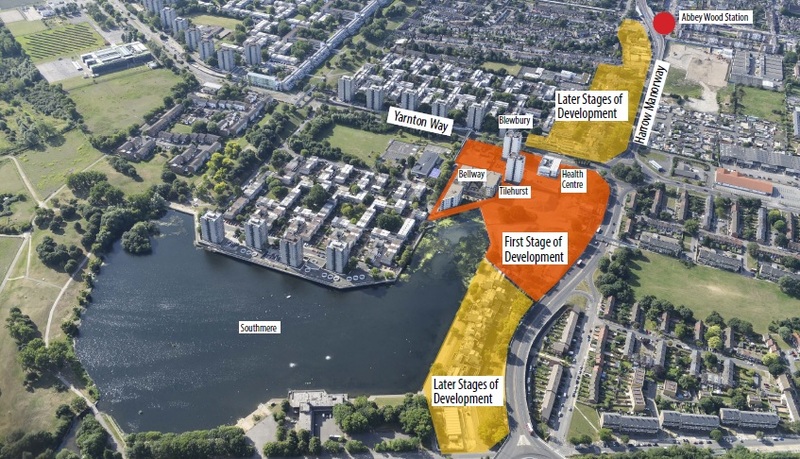 Across the dividing line of Harrow Manorway, Thamesmead is younger, and less iconic, and belongs to Greenwich. This is also where the 51½th parallel crosses the massive sewer and dual carriageway which divides Thamesmead more physically, and makes a beeline for further open space. The eastern end of Birchmere Park consists of recreational glades, the central section is 100% grass and the western end boasts a twelve acre landscaped lake (which is the hub of all the waterway corridors hereabouts). I follow a typical family on their journey through; a bullet-headed Dad leading an unwilling hound, a young son driving a miniature red car, and an elder daughter being shouted at when all she was trying to do was follow instructions. They stop to feed the geese, beside two cannons left behind to remind residents that this used to be Woolwich's firing range, while a pair of weary anglers wait for this cacophony to pass. 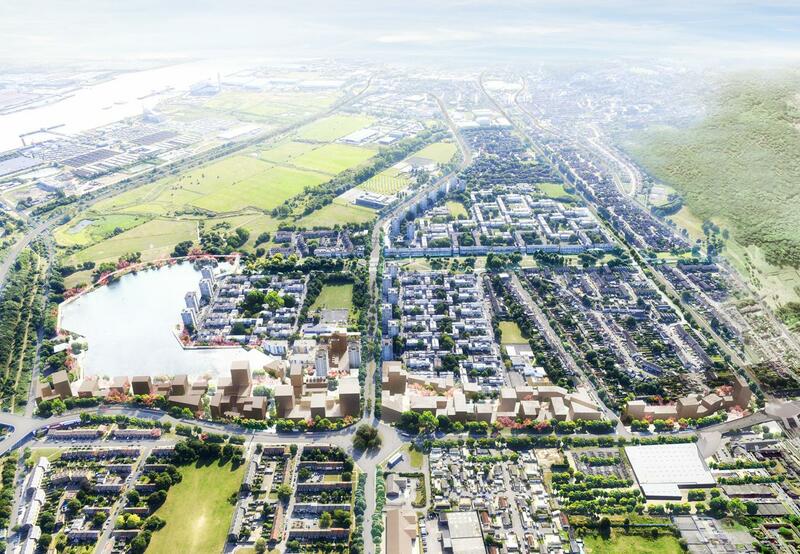 I find to my cost that there is no pedestrian connection between the two estates beyond Central Way, the intermediate wasteland awaiting massive redevelopment after the Gallions Reach Crossing one day, maybe, leaps off the drawing board. The yellowbrick houses along Newmarsh Road aren't ageing well, and some owners aren't taking as much care of their properties as others, so I'd say this faded enclave has future slum written all over it. Zero points to the planners who named this disconnected estate after a neighbourhood centre they can't easily reach. Conveniently located only for staff at Belmarsh prison, this labyrinth of flats and townhouses is enlivened only by an artificial hill added in an attempt to give the place some character, and a landscaped drainage channel. I descend a set of log steps to the one wooden pontoon the ducks haven't occupied, while a total handful of a boy rides over the footbridge in a state of midsummer agitation. 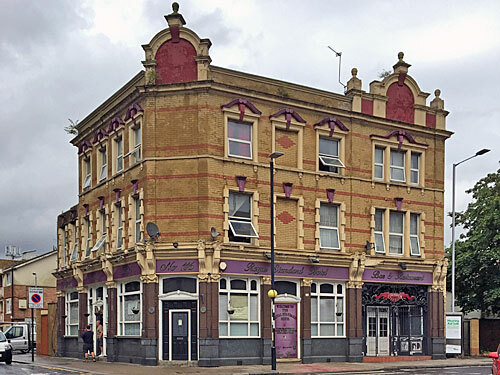 If you live round here, the Princess Alice is your sole pub/carvery option, a cheerless building named after a local mass drowning. If you don't live round here, and aren't called for jury service at Woolwich Crown Court, I suspect it's best avoided. 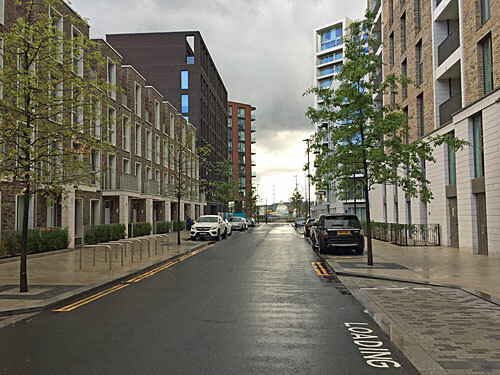 51½°N has hit the Thames again, at one of the first East London locations where private developers thought high rise living might be a good idea. 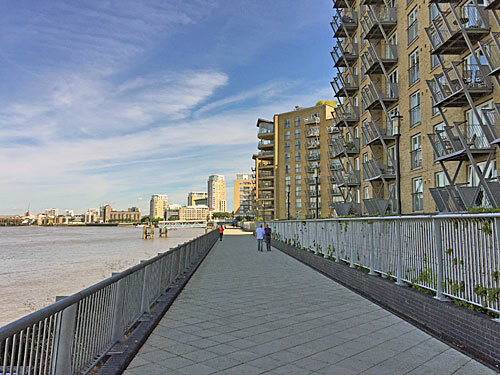 Now Woolwich is getting in on the act, big-time, but here we are a mile downstream on a godforsaken bend where many of the first residents weren't as happy as they might have been. 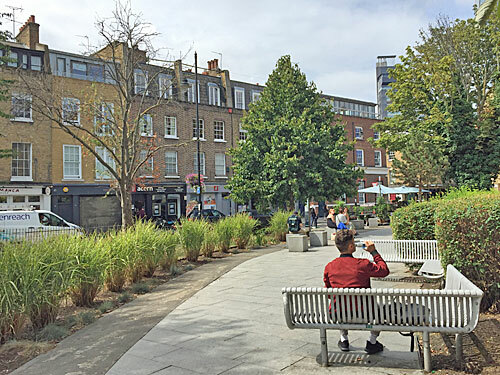 But the Royal Arsenal development has tugged the place somewhat closer to the action, and Crossrail may be the breath of life everybody needs. I watch, perturbed, as a local family ascend to the highest point on the river wall and their youngest child announces "I can see the sea!" Newham's a fair way across the water, as well as where all those noisy planes are landing, but City Airport's hardly overseas. 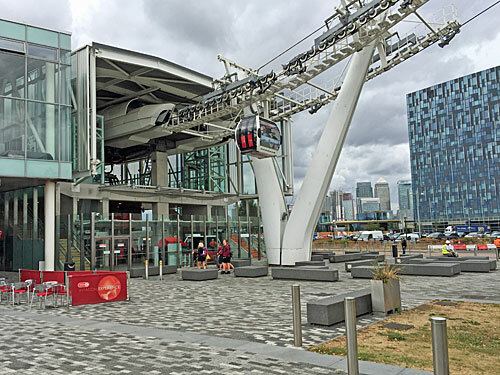 Of all the places to coincidentally end up, the southern terminal of London's best-loved cablecar is surely as good as it gets. 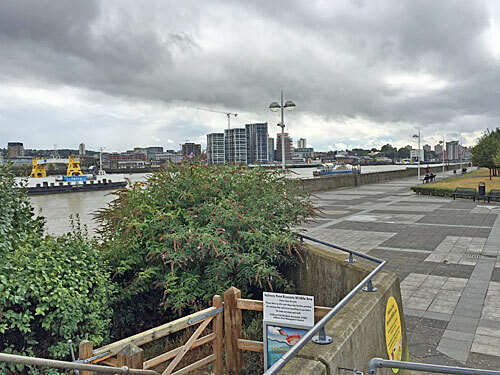 Nowhere else in London can you take off and soar over the breakers yards of Silvertown, taking in all the glories of the estuarine Thames as you go. On the day of my visit the service is being well used by out-of-town parents keeping their kids busy with a brief school holiday treat, and ageing rockers who've arrived at the O2 too early for tonight's Iron Maiden gig and need something to fill the time. Despite the fact that Oyster and contactless is the cheapest way to fly, everyone's queueing up to pay extra for the Airline Discovery Experience emblazoned on a sign stuck above the ticket office, which'll bring them straight back here after they've discovered how dull the area around the Royal Docks terminal is. My cynicism for this Mayoral white elephant remains undimmed. The latest commercial development inside the terminal is a souvenir kiosk, carefully positioned to attract passengers coming down the stairs after southbound flights. One of the Dangleway's many surplus members of staff hangs around in front of shelves of branded goodies, including a fridge magnet for £3, a fudge bag for £4, a thermal cup for £7 and a selfie stick for a tenner. They know their target audience well. If you've ever wanted an Emirates-red baseball cap with the cablecar's logo on the front, and have £9 to spare, you know where to come. None of this is freshly sourced, it's the same tat they've been selling in the gift shop in the cafe opposite for years, and another member of stuff lugs extra boxes of snowglobes over should they run out. Every year, without fail, the cablecar provides additional confirmation that it remains a tourist-milker rather than a useful means of public transport. 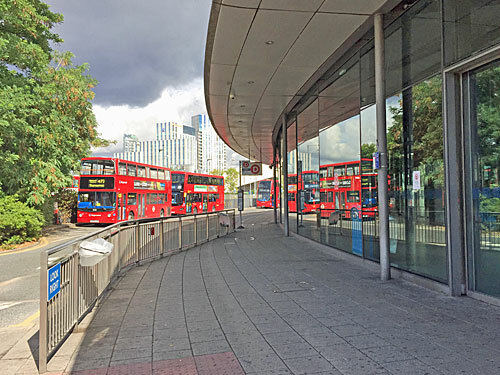 ...and not just the bus station but the centre of the bus station, the midpoint of the arc, immediately opposite the escalators where the Jubilee line disgorges. Here are blue bins stacked with copies of this morning's Metro, and plastic bags into which tonight's Standard will later be flung. Three yellow cones warn that the floor might be wet, two purple footprints point off towards the local animatronic dinosaurs, and arrivals from Charlton dash to grab a Caffe Nero before descending into the depths. 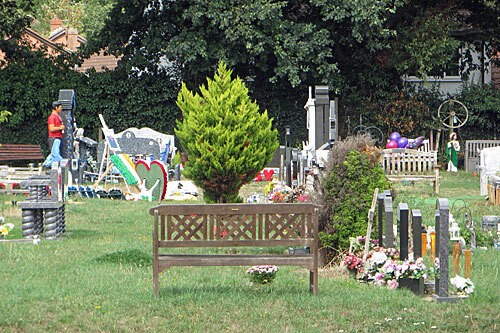 This is a space which sometimes seethes with people, but today is quiet as a lamb. Of course this millennial transport interchange is due to be swept away in a few years's time as the Lords of Greenwich Peninsula replace it with a three-pronged crown of shops and flats, which'll be great if you've ever dreamed of something better than a W H Smith, but likely less convenient if all you want to do is catch a bus. In the meantime, if what you truly desire is a copy of the May 2017 tube map, the Travel Information desk has a handful in its racks and a box of 3000 on the counter (but you'll be lucky to catch it open). Dammit, it's impossible to stand on the precise spot where fifty one and a half degrees north crosses the zero meridian because it lies in an undeveloped zone behind hoardings. The intersection's about halfway between the entrance to the Blackwall Tunnel and the River Thames, on a former aggregate-processing site called Delta Wharf. 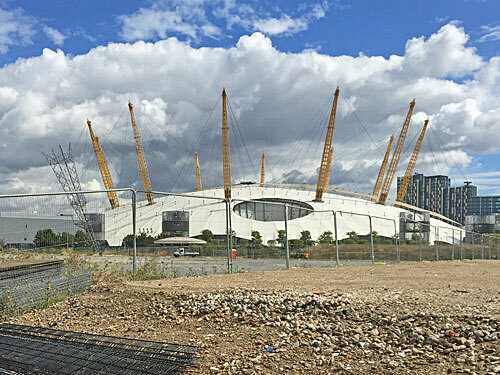 The godforsaken backwater of Tunnel Avenue is as close as you can currently get, unless you're the lackey who picks up the golf balls at the far end of the Greenwich Peninsula Driving Range. 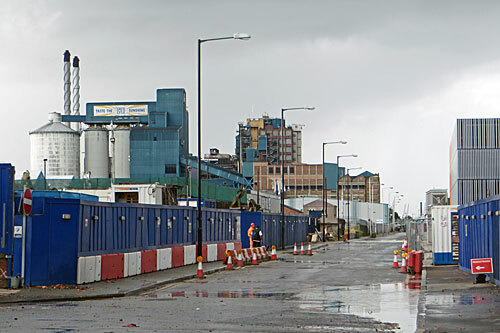 The last vestiges of industrialisation were razed from Delta Wharf in 2009, but the rest of the site remains vacant until developers Knight Dragon finally get round to building Meridian Quays ("boutiques, bars and towering waterfront living at its most glorious"). 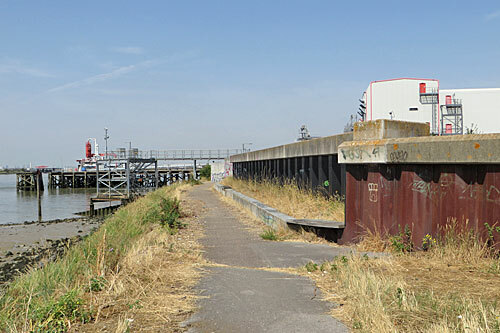 For the riverside view, take the Thames Path south from Drawdock Road, almost to the jetty [51.5°N 0.002W°], where a semi-overgrown bench has been provided for your comfort. The skyscrapers of Docklands look particularly imposing from over here, I always think. Frosted half-globe lights line the promenade, wild flowers sprout in the gap between footpath and cycle path, and all could be quite pleasant were it not for the fenced-off nomansland behind you. In a city with a housing crisis, it seems insane that a peninsula cleared for residential redevelopment almost twenty years ago still hasn't got its act together (and, affordably at least, probably never will). 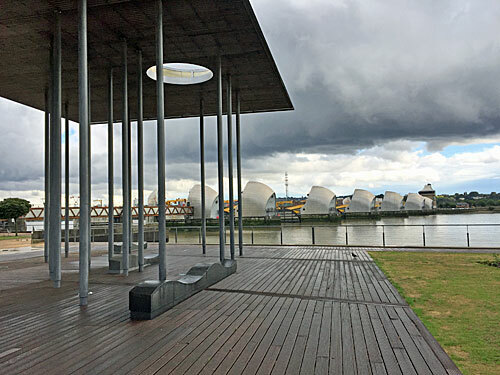 My line of latitude's arrival on the Isle of Dogs coincides with actual riverfront access at the tip of Stewart Street. 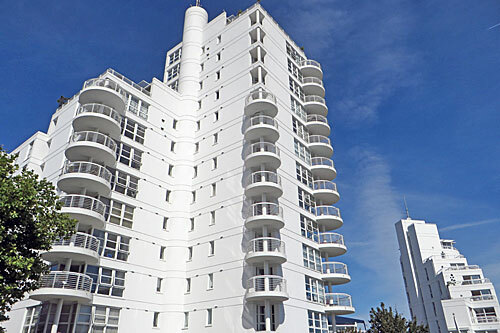 The dominant building here is quite something, an apartment block of pure white graduated towers stacked high with circular balconies, dipping backwards in a kind of swirling horseshoe formation around a landscaped terraced garden. It almost looks like some giant 1930s ocean liner has docked beside the Thames. This is Pierhead Lock, completed in the year 2000 before the area became hugely desirable, hence of far lower density than anything Barrett Homes would build today. There's no gym on site, the poor darlings, but residents do have access to a tiny private concrete jetty with two benches and a flagpole. I don't know what you do when you see a sign that says "Strictly No Loitering", but I hung around for an extra few minutes to revel in their glorious meandering panorama. If you're familiar with Docklands, 51.5°N sadly misses the main highrise cluster and crosses the peninsula to the south, approximately along the line of Marsh Wall. 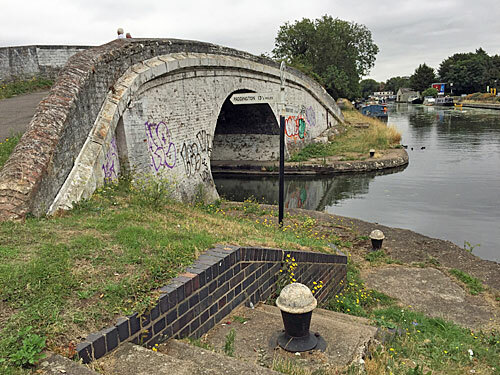 But it does score a direct hit on the bridge at the entrance to Millwall Inner Dock, where red flashing lights would halt the traffic if only any of the sailing boats moored up alongside wanted to nip through. 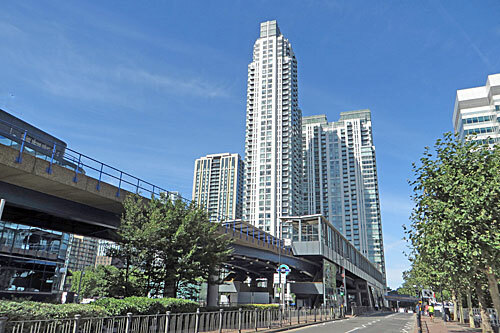 This is also where South Quay DLR station was relocated in 2009, spanning the waterway and creating a gloomy undercroft beneath its platforms where yesterday's lunch wrappings inexorably accumulate. I particularly liked the street sign at 191-195 Marsh Wall, across the road, which still bears the original 80s logo of the LDDC quango. The only skyscraper on the 51.5°N line of latitude is the 48-storey Pan Peninsula, which overtook the Barbican's Shakespeare Tower as London's tallest residential building in 2009. Some of the office blocks close by are the same bullet-grey cuboids erected when Docklands was new, others are covered in the telltale multicoloured panels of the late Noughties, and several more are in the process of being demolished to make way for something bankers can live in. I don't know how much longer the geometrical sheds of Skylines Village can hold out against the 48-storey tower described in the planning notice pinned to a lamppost outside, but for the time being they house a useful collection of (very) small businesses which help keep the neighbouring financial empire ticking over. And on the western edge of the Isle of Dogs, another screen of flats. You can probably guess roughly when Millennium Harbour was built, its residents cursed by tiny slanting balconies smaller than the minimum area permissible today. I turn my attention instead to the Thames, a classic section downstream of a serious bend, and watch the river traffic riding the tide. i) a Thames Clipper, zigzagging over to Greenland Dock. ii) three Rigid Inflatable Boats, giving their paying customers the weaving speed-blast they paid £30 for. 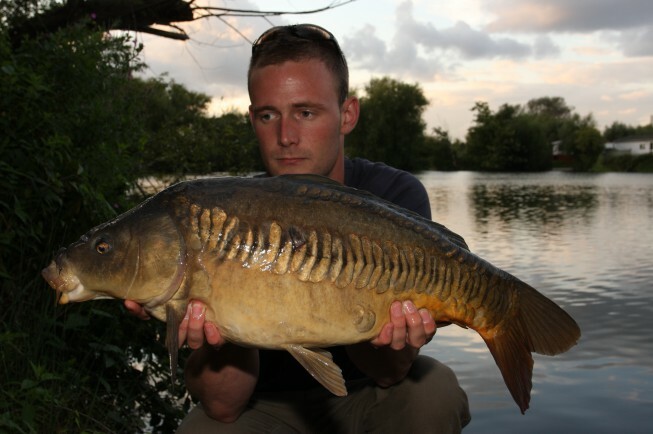 iii) a bright orange open-topped launch, ferrying a trio of hi-vis guys upstream. iv) three dozen empty waste containers on a chain of barges, heading to the City for refilling. v) a cruiser called Pride of London, its rear deck packed with identikit beery blokes in Crystal Palace jerseys singing "Who are ya?" at the tops of their voices, a huge St George's flag draped from the stern. It's a fabulous spot to pause and watch London drift by. 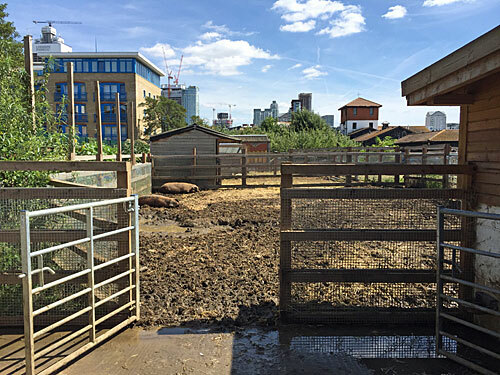 I'm too old to have a favourite city farm, but this delightful farmyard slams in high on my non-existent list. 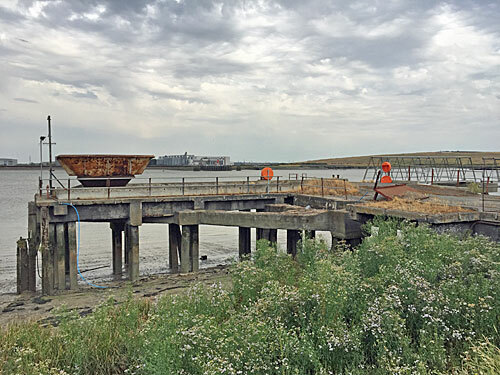 It's been here by the riverside since 1986, before which the site has been a shipyard, timber yard and a receiving station for smallpox patients. 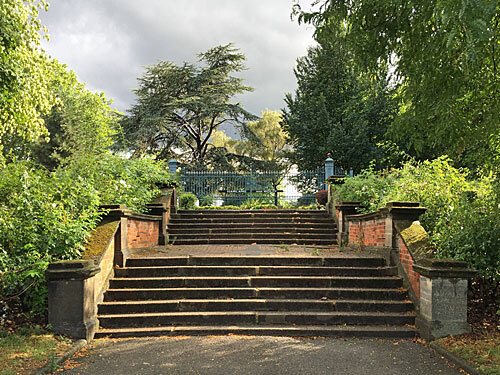 It's easy to slip in from the Thames Path, by the herb garden, but most parents and very small children enter via the main gates on Rotherhithe Street. There is an unmistakeable whiff of livestock just before you head inside. It's amazing how much has been crammed in, including a central yard where you pet the goats, a duckpond, a blacksmith's forge and a small orchard (please do not pick the loganberries). Animals kept along the 51½°N line include Alice and Hermione the donkeys, who give rides to those of small enough stature, and Rupert, Winnie and Marmalade the Oxford Sandy and Black pigs. A path laid with mosaics leads round the back of their pens to the Muck Heap, which might explain that whiff earlier, passing the Youth Allotments where a crew of young locals grow flowers and veg in raised beds. One of these children was proudly telling her Mum about all the good work she'd been doing with the farm animals that morning, and pointing out her sweetcorn of which she was evidently very proud. The sunflowers are coming on particularly nicely. And don't forget to wash your hands before you leave. We don't quite get to pass Stave Hill, one of London's largest artificial hills, which is a shame because it's the only elevated bit of land for miles with an actual view. 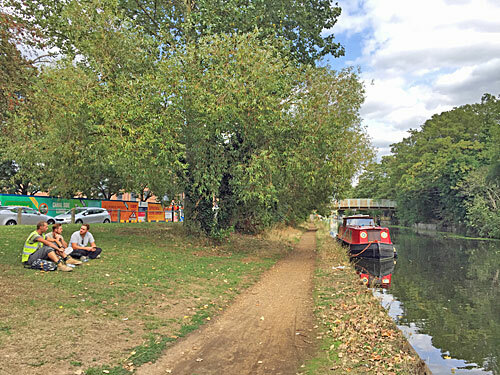 But we do cross Russia Dock Woodland, which is one of the original Surrey Docks filled in to create an ecological buffer, with tiny meandering paths amongst the trees, a wider recreational space, some very keen volunteers and a few old wharfside rails thrown in for good measure. 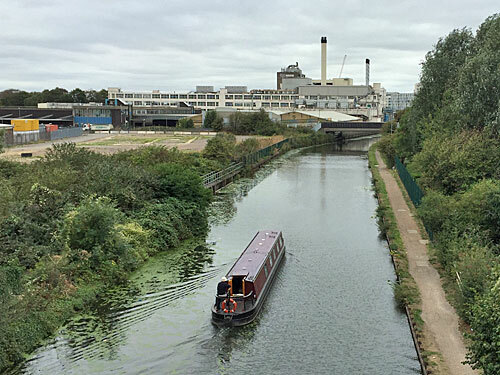 I wanted to stop off somewhere in the old Surrey Docks to take the temperature of the 80s redevelopment, so picked this artificial waterway running across its heart. Originally this was Albion Dock, one of a labyrinth of ten, and the edge of the docks can still be seen as the higher of the two paths along the eastern side. Most of the rest was filled in to create a place the LDDC hoped people would want to live, and they've been proved right. What's striking is the variety of styles, from pointy-topped stacks to sweeping curved crescents, with red brick flourishes and primary-coloured window frames for added interest, and what's also striking is how not-very highrise the development is. These days they'd have crammed far more people in, indeed down at Canada Water they're doing just that, and nobody gets to live alongside a duck-topped iridescent green channel, more's the pity. 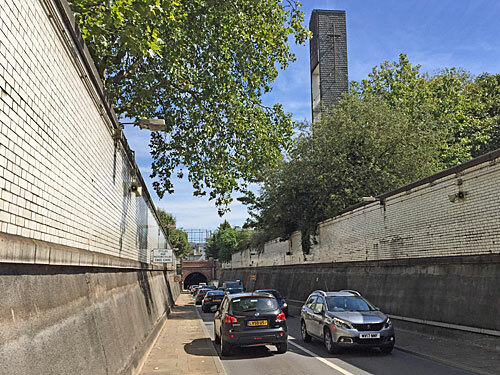 I was worried when I saw that the 51½th parallel crossed the Rotherhithe Tunnel, because I've walked through this polluted tube once and once was enough. But it all turned out fine because the relevant slice is out in the open, on the gentle descent from the roundabout, not far from the huge gates that slam shut to read 'Tunnel' 'Closed'. A slew of signs along the glazed tiled wall warn incoming drivers what they should, must and absolutely cannot do for the next zigzag mile. Breaking down is strongly unrecommended. 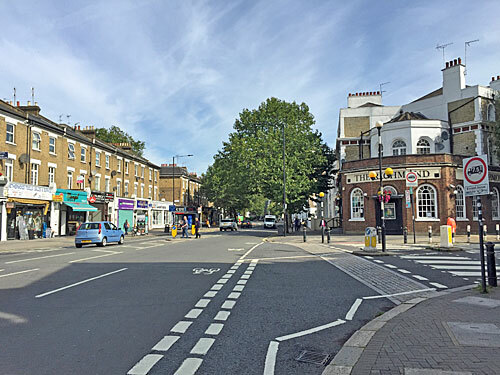 I love that the Edwardians laid a pavement along both sides of the carriageway, but 21st century pedestrians shouldn't expect to be able to cross from one side to the other as the flow of two-way 20mph traffic never stops. Two church towers rise above the approach ramp, both belonging to Scandinavian places of worship, and originally built for the benefit of seamen. The one with a copper spire atop what looks like a town hall is the Sjømannskirken, a Norwegian Church Abroad, and gives its name to neighbouring St Olav's Square. The one that looks like a firefighters' practice tower is the one we're interested in, because it's on the right line of latitude, and that's the Finlands Sjömanskyrka, or Finnish Church. 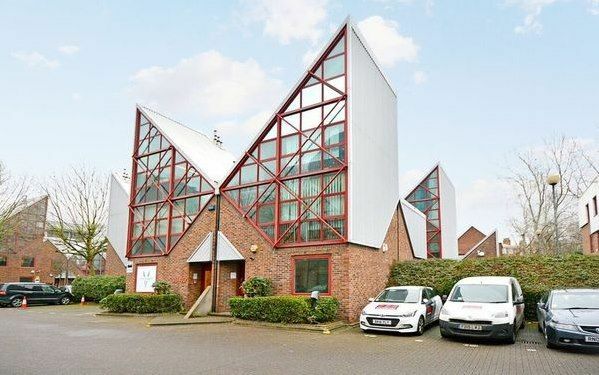 It looks very much like a small block of flats, but if you ever get inside (say for the annual Christmas Fair) it resembles a modern and rather compact school hall. These days the seamen are long gone, and both the old pubs bookending the shopping parade opposite have closed down, and [insert usual comment about how fast London changes]. Another direct hit, and our first ancient monument. Edward III built a moated property here around 1350, when this was merely a watermeadow, with a gatehouse facing the Thames to allow him to come and go by boat. Nobody's entirely sure why he picked the hamlet of Rotherhithe, but falconry's the likeliest reason. By the 16th century river access had been lost and the manor house went private, becoming a pottery, then partially warehouses, then was entirely demolished in the 1970s other than a few foundations. These now sit at the centre of a sparse lawn, the indentation of the former moat clearly visible, watched over by an astonishingly mundane terrace of Southwarky housing. Better known is The Angel pub, a much more likely destination for those walking by, which dates back to the 17th century, not the 14th (when this particular bit of land was in the river). 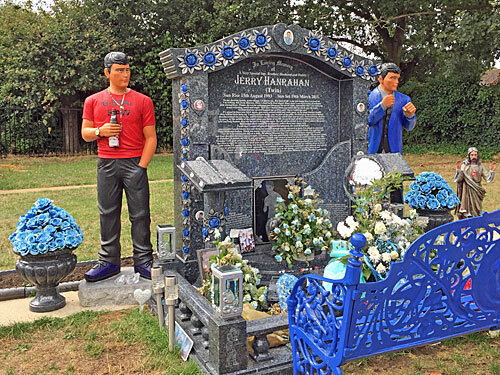 Best place on today's walk for a Thames view, this, on the outside of the final bend before the Pool of London. I'm pausing here, on Jamaica Road, because something's changed. For the first 12 miles of my journey I don't think the line of 51.5°N crossed a single house or dwelling place that was more than 50 years old. Partly that's because of the quirkiness of the line travelled, but mainly because estuarine London wasn't particularly development-friendly until relatively recently. 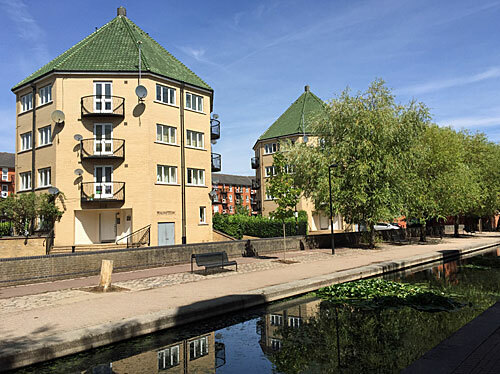 But here on the Dickens Estate the five-storey LCC blocks are of 1930s vintage, at the extremity of the SE1 postcode, and are built on the site of the infamous Jacob's Island rookery. Dockhead also has the first shopping parade I've come across since starting out, which boasts an art gallery, an organic cafe and a quality dry cleaners amongst its semi-gentrified line-up. Two of the shopkeepers are out front chatting, because for much of the week nobody's really interested. The doors of Most Holy Trinity RC Church are firmly bolted. Shad Thames isn't far away. It feels like we've finally hit the city. Oh. My. Word. I have somehow never managed to be here at the weekend before, and I am unprepared for the seething crush on the far side of what looks like a quiet railway viaduct. A few of the arches on the Druid Street side provide clues, like the hairnetted lady from the St John's Bakery selling doughnuts and three quid Eccles Cakes fresh from ovens under the railway. But it's on the other side, along the narrow Rope Walk, that the foodie herd squish to enjoy the very best in everything Time Out adores. Some sellers serve out of the arches themselves, perhaps dispensing gin, raclette or beefsteak. The majority serve from little stalls, griddling while you watch or unpacking from coolboxes stashed underneath. It is rammed. The clientele is mixed, but mainly young, the occasionally gymbod leading his parents into the melee to source something with noodles. At the Cheese Truck a grilled stilton, bacon and pear chutney sandwich costs an amount with the trailing zero missing. Craft beer is big. An acrid smell sparks the alleyway. Only the central section has tables, and they're all taken, so latecomers juggle their way to the council estate car park at the far end holding a plastic trayful in one hand and a cup of tinkered juice in the other. Not everyone's pleased. "I can't believe they charged £6 for this and skimped on the chicken," joshes one lad to his mates, But most have the look of regulars about them, Maltby Street being where they kick off their weekend to ensure it isn't wasted. 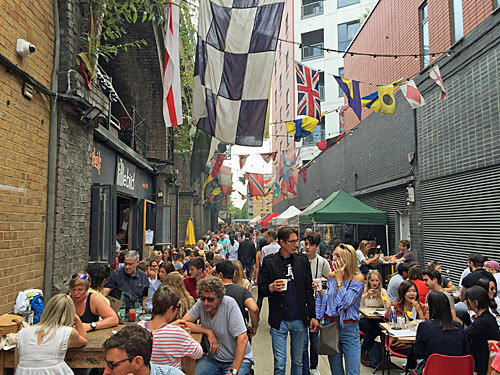 How hip is Bermondsey Street? Not at its northern end, where it slinks beneath London Bridge station, but down here winding through the becalmed historic heart of Bermondsey proper. Time Out are hyper for the place, evangelising especially about the food and drink options, but also the retained artsy craftsy vibe. 51½°N sweeps in across Tanner Street Park, around half of which is tennis courts, and well-used tennis courts at that. The remainder is mostly grass and path, where creative types come to recharge, students skim through their college notes and well-dressed women follow behind tiny pugs with plastic bags poised. What looks like a cafe in the corner is more of a restaurant, with pre-booked tables and a wine list, so Al's Cafe on the main street is a better bet. A shop called Lovely and British promises Eclectic British Sourced Lifestyle Shopping, and is shelved with stuff nobody genuinely needs, which doesn't stop it being busy. The average age of those hereabouts looks to be below average, while the average income looks to be above average, in sharp contrast to the slice of Southwark we're passing through next. I'm peeved because the White Cube gallery isn't quite on my invisible line, so I have an existential debate with myself about whether 51.4998°N really counts. It's only ten metres out, and if my smartphone were less accurate it'd be reading 51.500°N anyway. I decide no, it doesn't count, but go in anyway. I enjoy the latest exhibition, Memory Palace, more than I expected. The themes it's hanging off are tenuous, but some of the artwork is challenging and splendid, and I spend far too long looking at Jac Leirners collage of 1980s regional advertising. Best of all there's a new-ish Christian Marclay film to enjoy, a 24 minute decontextualised splicing of movie scenes depicting the destruction of art, and it totally hyped me up for next month at the Tate. The next kilometre is the dull stretch I hinted at earlier. I'm expecting a lot of this kind of thing out west, but wasn't expecting to experience it quite so close to the South Bank. 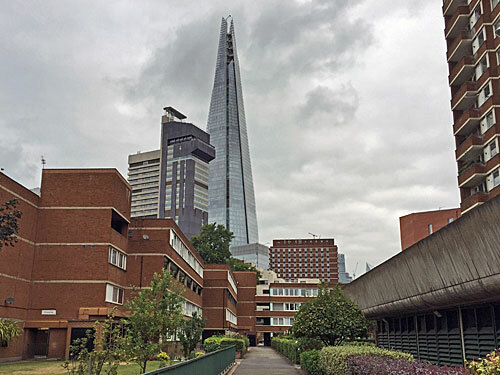 It turns out northern Southwark has an entrenched residential/commercial underbelly of housing estates, backstreets and minor office blocks, as if the primeness of the location has been overlooked simply because it's south of the river. The Leather Market [51.5°N 0.085°W] once housed true craftspeople, but now hosts recruitment consultants, marketing executives and novelty wellness engineers. The stark terraced flats of the Lockyer Estate [51.5°N 0.086°W] have an unavoidably undernourished feel. On the Kipling Estate, Richer Sounds Head Office [51.5°N 0.089°W] is a peculiar bastion of modern infill, opposite an LCC block where a council operative is strimming round the pear trees. The Royal Oak [51.5°N 0.091°W] is a traditional Victorian boozer serving Sussex ales, and a highly recommended watering hole, but I'm too early to get behind the net curtains. Lighthouse-keepers Trinity House own a lot of land alongside Borough High Street, which is why Avon Place [51.5°N 0.094°W] has a bicentennial mural along its length featuring Henry VIII, osteopathy and a fox chewing a brake cable. Here's an oddity off Great Suffolk Street, an entirely atypical council estate built by Southwark's architects in the 1970s. 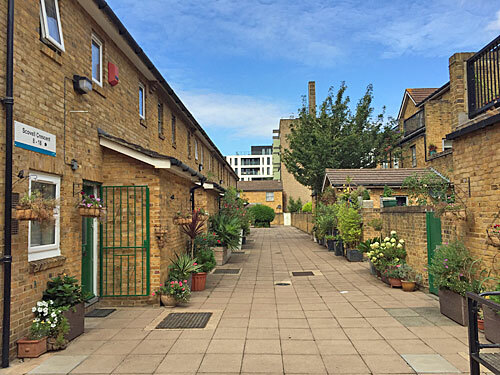 Long blocks of totally lowrise housing run along pedestrianised walkways decorated with pot plants and hanging baskets, with a few garages hidden out of sight out of mind. Many residents have little back gardens, with gate access to one of the mini streetlets, and some actually own bungalows. You see this kind of development further out from the city centre, but here we're less than a mile from Westminster Bridge or the Bank of England, so it all feels delightfully parochial. I don't think residents are used to many cut-through visitors, though. A lady out chatting to her neighbour has to break off ("Olly!") to stop her Jack Russell ("Olly! Olly!!") from chasing after me ("Olly! Olly!! Olly!!! "), and my presence leaves both quite perturbed. Nearly, not quite at St George's Circus, the foot of Blackfriars Road is in flux. The old BT offices at Erlang House have been demolished, and in their place has arisen Blackfriars Circus, a large Barratt development whose last penthouse apartments are currently up for sale for between £1m-£2½m. 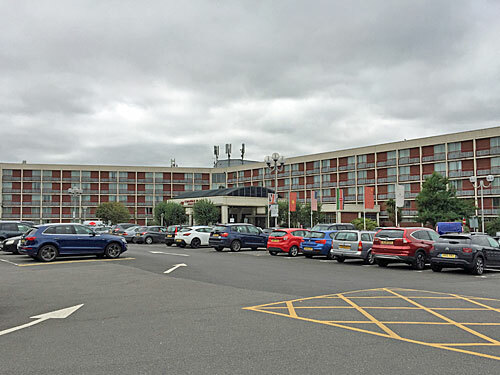 The ground floor retail/restaurant units have yet to be filled, apart from a Tesco Express, whose delivery lorry has decided not to park in the bay provided and is blocking the single southbound carriageway. 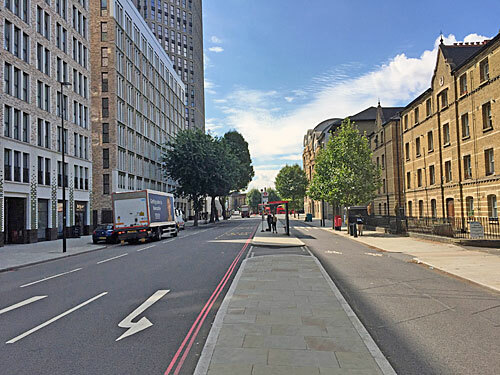 There used to be two lanes, but one has been sacrificed to a smart whizzy Cycle Superhighway on the other side of the road, the two-way nature of which throws me when I walk out into it without looking. Thankfully no Super Cycles were incoming. Facing Blackfriars Circus is a completely different approach to housing, in plain London brick rather than some fancy variegated palette. Peabody Square is a Victorian collection of four-storey tenement blocks, each with a central porch, and each of these topped off with a keystone flourish depicting a letter of the alphabet. Blocks A to R run clockwise around the first great courtyard, now filled with a micro-playground, while a second quadrangle juts off from the rear. It's quiet and human in scale, admittedly concierge-free, but I'm sure most residents are happier to pay less rent rather than have a suave clerk to sign off their Amazon packages. A plaque confirms that the Queen Mother visited in 1962 to mark the centenary of the George Peabody Donation Fund. 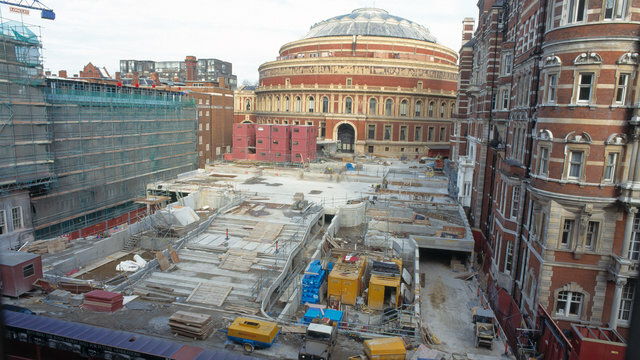 Expect Blackfriars Circus to be demolished long before any royal curtain-tugger drops by. Just briefly, let's do Lambeth. 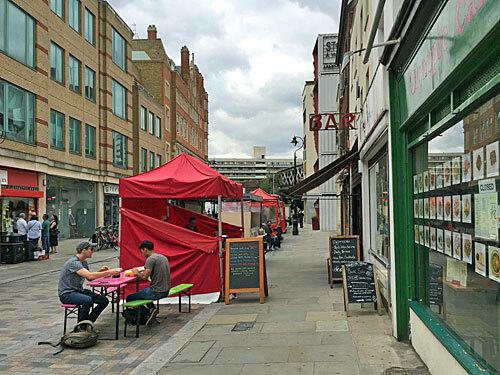 Lower Marsh is a beloved market street, technically a conservation area but very much a treasure in transition. Several quirky old businesses survive - the Olympic Cafe has a slew of photos of its Chinese menu across its window, and Top Wind is a flute shop whose retro frontage seemingly hasn't changed since it opened in 1991. But elsewhere are blatant incomers, like Waffle Doodle-Doo and Vaulty Towers, and heaven knows how anyone gained planning permission for the geometric white condo at the western end of the street. All the street vendors serve from identikit stalls in Olympic ring colours, with tables alongside to enable rapid guzzling. Don't expect hot dogs, it's more Taste of Morocco/Falafel Wrap/Newdlez.com kind of line-up. I greatly approve of Barbarellas cafe because one of the things advertised on its shopfront is panini, plural. The beggar sitting crosslegged outside the Co-Op is busy reading a book, obliviously hoping that passers-by drop coins into his empty popcorn tub. At the far end of Lower Marsh the multiple tracks heading out of Waterloo station cover a large portion of Westminster Bridge Road. It's gloomy under there. 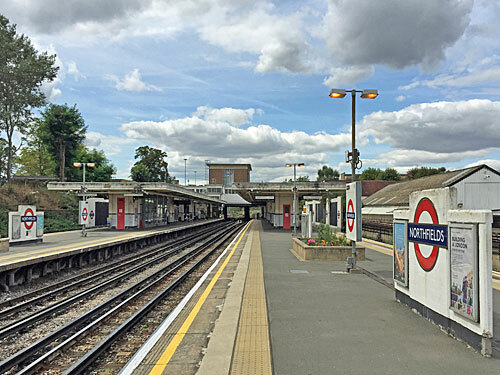 Only four of Waterloo's platforms extend far enough to just cross the line of 51.5°N, and they're the former Eurostar platforms so are currently out of commission. I've ended up at London's most central hospital, thankfully of my own volition. Entrance to the site is on two levels, a concrete walkway for independent visitors and a canyon below for all kinds of ambulance. One neonatal carrier from the Kent coast has seemingly come a heck of a long way. Inpatients has recently been relocated to Gassiot House, alongside the Pain Management Unit. I watch as a member of staff, downgraded from her receptionist role by automation, politely tells a checker-in that they may have to press harder because the touchscreens "can be a bit temperamental sometimes". Beneath my feet is the Florence Nightingale Museum, which I had been planning to pop inside because it's the first museum I've encountered on the 51½th parallel. Instead I transfer that baton to Ian Visits, because he's just published a review of the place, saving me the need to go round again. The Hospital Gardens provide a chance to escape the wards for staff and patients alike, for example the nurse who walks past shepherding an old man in pyjamas. Other orderlies are grabbing a bite to eat around the new statue of Mary Seacole, or wandering off site completely for a cigarette. Someone medical-looking is breastfeeding her baby while she takes lunch. Caution, the water in the fountain is impregnated with chemicals. A new plaque reveals that Searle's Boathouse, first home of the Leander Club, was established here in 1818. A siren wails as another arrival pulls in down below. Once again I'm hugely impressed by the NHS's compassionate ambition (and equally despairing of an official poster I spot on a wall by the ambulance park praising the valued contribution of "Siemens Healthineers"). The point on the Albert Embankment where 51.5°N launches off across the Thames is marked, coincidentally, by the memorial plaque to the victims of Human BSE (vCJD). 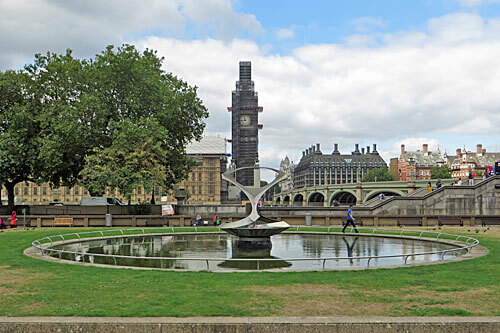 The spot is very popular with tourists, who like to place one or more of the group against or on the river wall and take photos with Westminster's gothic turrets immediately behind. Westminster Bridge is very close by, along the line of 51.501°N, but I've come on the one day passage is sealed off by a strip of blue and white tape, two police cars, several clustered officers and at least one wielded weapon.I will get across the river to continue my latitude quest, but alas a screwball in a Ford Fiesta got there first. The oldest building in Parliament, built at the behest of William II in 1097, Westminster Hall was once by far the largest hall in Europe. And if you fancy taking a look inside, it's free to visit. I think you can just walk up on spec, but I pre-booked a ticket to view the latest exhibition tucked away in the corner of the hall... two hours notice was fine. I waved my printout at the visitor entrance and swanned down the ramp, entirely alone other than Oliver Cromwell watching over me. At the bottom I went through all the obligatory airport-style security procedure, relieved that I'd remembered not to bring a bag or wear a belt. And I noted that there were at least 16 people present in this small anteroom, watching over the scanners and conveyors, some with guns, and was almost pleased I'd turned up to give a few of them something to do. Westminster Hall is an architectural marvel, especially the enormous 14th century hammerbeam roof, a fortunate survivor of blaze and blitz. A lot of it's under sheets and scaffolding at the moment, which is good news for its longevity, but less than great if all you want to do is admire. It has to be said that the general impression isn't helped either by the presence of a large exhibition in one corner, but it is an excellent exhibition so more than deserves its summer residency. 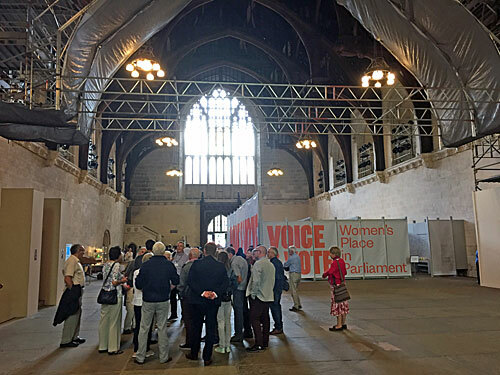 It's called Voice & Vote, an archive-rich history of women's place in Parliament, and will be straddling 51.5°N until 6th October. From its opening line ("Women have always participated in politics, but not on equal terms with men") it is perfectly pitched. I discovered that in the 18th century women were only allowed to view Parliamentary proceedings by peering down through a ventilator in the roof, and that the campaign for the vote started well before the suffragettes. 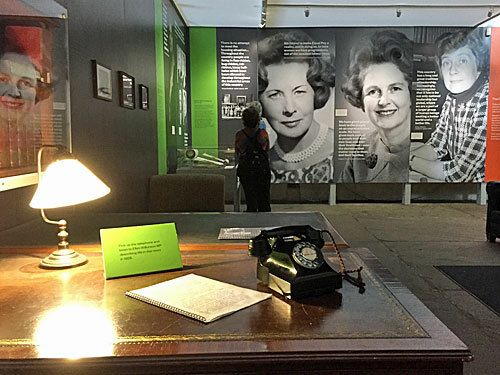 I saw the plaque Tony Benn had placed on a broom cupboard in honour of Census-overnighter Emily Davison, and the actual Acts which sequentially introduced the vote for all. I learned that the first female MP stood for Sinn Fein so never took her seat, and was inspired when Mhairi Black stared me in the face and told me why she's proud to be here. It never hurts to be reminded about the intricacies of the battle for equality, and it's always worth remembering that Westminster Hall is totally open for a visit. Most of the others thronging Westminster Hall were on official £20 tours, which are daily during the summer recess, or suited staff nipping out through mysterious doors. A lot of milling around was going on, as groups stopped to hear a nugget of original history, or hunted for the plaque showing where Winston Churchill lay in state. The shop was also popular, especially because the cafe is currently closed for renovation so it was the only place to buy refreshment. Parched souls who only wanted a bottle of water were being forced to queue behind folks on coach trips stocking up on House of Lords wine gums, or even House of Commons babygrows. Democracy is a many-faceted and splendid thing. Sorry, not quite Westminster Abbey, but the parish church in its shadow facing out onto Parliament Square. The current building's fast approaching 500 years old and serves a very central clientele, so tips the high end of the scale as parish churches go. Also, whereas getting into the Abbey costs £20, popping inside St Margaret's is free, even though you have to join the same queue to get through security. It took me 15 minutes to inch across the churchyard to the bag check, despite not actually having a bag. 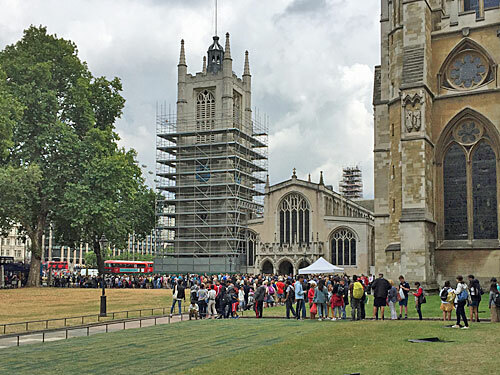 During the wait I listened in on an American family planning their week-long London trip based solely on where the sightseeing buses would take them, and advised another traveller that no, this wasn't the line for Big Ben. Maybe the scaffolding confused him. Eventually I reached the front door - I believe access is a lot easier in the winter - and politely put my camera away. Photography is banned inside St Margaret's, as a well-placed pictogram in the aisle decrees, although this doesn't stop bored tourists wandering in for thirty seconds and taking several photos. Alas that means I'm unable to show you how impressive the interior is, especially the ring of historic memorials around the wall. The recipients are an eclectic bunch, as befits a long-standing Westminster building, and include Olaudah Equiano (baptised 1759), Samuel Pepys (married 1656) and Henry Layard, Discoverer of Nineveh (died 1894). I was hoping to join the "free 20 minute tour with one of our guides" advertised outside the front door, but no guide turned up at the appointed time, nor either side of it, so that was my opportunity to be properly educated royally stuffed. Sung Eucharist is held every Sunday morning at eleven, which is no doubt a better bet. In readiness for the centenary of John Wesley's death, the Methodist Church asked its followers to each contribute one guinea towards a worldwide mission fund. 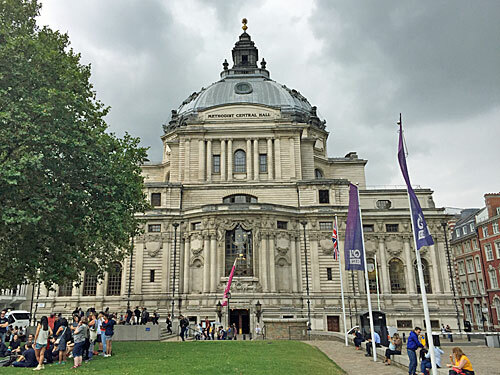 They raised a million, and Methodist Central Hall was the largest project to be delivered. 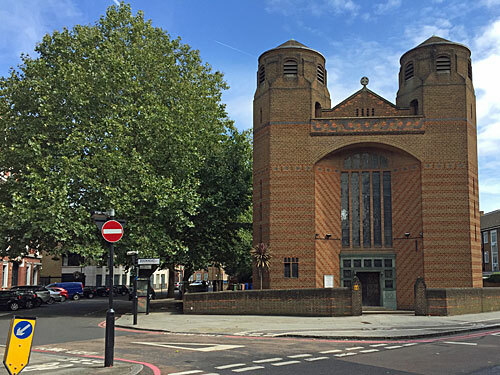 This grand baroque building (opened in 1911) was deliberately designed not to look like a church, indeed the current chapel was formerly a branch of Midland Bank. Wesley's Cafe in the basement is a useful drop-in for non-chain refreshment, but you can also go inside for a proper look-around. Volunteers run free 20 minute tours, and these actually happen, although the one I went on started late and then lasted 70 minutes. I had no complaints. The main hall sits beneath the world's second largest self-supporting ferro-concrete dome (narrowly beaten by a Melbourne library, we were told). The organ is also magnificent although these days the congregation doesn't usually fill the upper tiers of cinema-style seating. The first session of the United Nations was held in this room in 1946, and the minutes are now on display in the visitor centre, along with a set of leatherbound volumes containing the names of all those million who gave a guinea. As for the grand staircase, this was based on the Paris Opera House and makes quite an impression, although it can't have been much fun for older members of the congregation to tackle before they put the lifts in. But the best bit of the tour came when our guide unlocked a side door on the upper landing, and led us outside onto the balcony with a mischievous smile. This is the same door the presenter of the BBC's New Year's Eve concert dashes out of just before midnight so they can stand on the balcony and gesture towards Big Ben, the London Eye and the imminent fireworks. 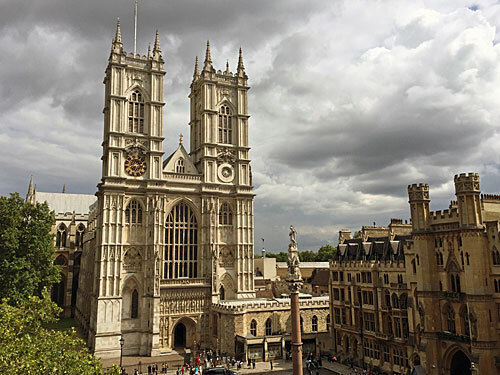 But it's the more immediate view which is most striking, of Westminster Abbey full on, its twin western towers rising in sheer magnificence (and to a lesser extent the QE2 Conference Centre to one side). I think we kept our guide busy talking and answering questions simply so that we could stay out here and gawp a little longer. I can't guarantee you'll manage the same, and in full sunshine, but sometimes the best London sightseeing is free. Where next? 51.5°N doesn't quite slice TfL HQ at 55 Broadway, but it does pass through the Ministry of Justice in their Brutalist spaceship opposite. It also passes through the Guards Museum, a repository of all things Grenadier, Coldstream, Scots, Irish and Welsh. Next it spans Wellington Barracks, not quite gracing St James's Park. And then, well, who'd have guessed? My chosen line of latitude misses the front, where the Queen waves on special occasions, but hits the tradesmen's entrance round the back of the State Rooms. Look for the wall topped with urns and follow it round. I watched a flow of palace staff returning inside after a break, several in unflattering brown uniforms, and overheard one poor footman claiming that he had no pass and no lunch because his trousers had bust. 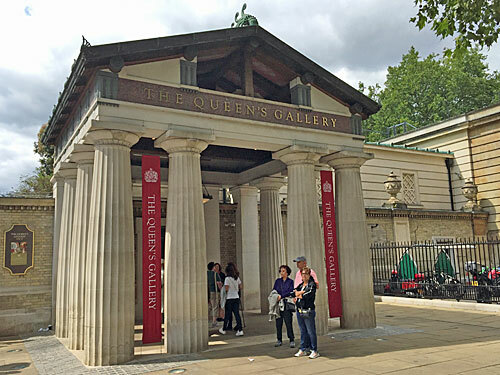 Here on Buckingham Gate is also the entrance for folk wanting to visit the Queen's Gallery, beneath a portico so outlandish you suspect Prince Charles must have had something to do with it. £12 currently gets you inside to peruse a collection of subcontinental treasures, but I'd recommend spending twice as much to go on the excellent tour of the palace proper instead. And when that tour is finished you'll be directed across the garden, where the Queen hosts her garden parties, and ushered out of a small back gate on the far side of the lake [51.5°N 0.148°W]. It's fun to stand here on Grosvenor Gate and watch tourists emerge, some dangling gold carrier bags, others wearing a crown they bought in the gift shop, entirely baffled which way to go next. Some turn right for Hyde Park Corner, others turn left for Victoria, and others fall into the hands of the pedicab crew, parked up on the pavement awaiting custom. It's £10 for a lift to Victoria station, which is all of 600m distant, not that I suspect most of those taking advantage of the offer realise this when they climb in. The epitome of unaffordable housing, Belgravia was a speculative development on fields to the west of London in the 1820s, and its success is why the Duke of Westminster is now exceedingly rich. 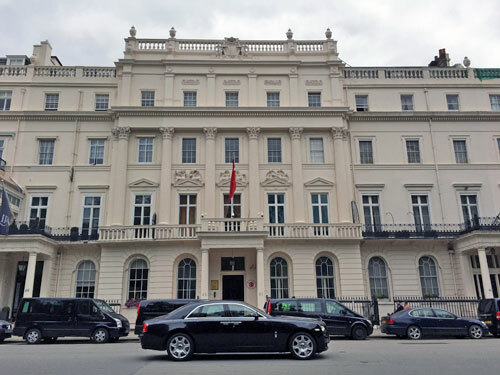 Belgrave Square is its focus, and is much larger than your average London square, but even so the architect only managed eleven houses on each side. Each is a mini palace hidden behind standardised white stucco frontage, although an element of difference exists in which particular style of heritage black lantern each resident has chosen to hang inside their porch. Counting flags confirms that least a dozen of the houses are used for diplomatic purposes, including the Turkish Embassy, which is a precise 51.5°N hit. A fleet of black cars and vans with diplomatic plates is parked outside, along with a cluster of visiting motorbikes, and every now and again a sleek black Rolls Royce glides past. I actually saw two in a row... we're not in Thamesmead now. At the square's northernmost vertex, where the anti-clockwise numbering starts, a statue of Argentine general José de San Martín faces the ambassador's residence on Grosvenor Crescent. The plinth lies within one of the few visible pockets of central garden, the remainder screened behind carefully cultivated shrubbery for the benefit of the few. On the traffic island opposite is the Romanian Centenary Garden, a raised bed planted with native flowers to mark 100 years since unification, although in late summer it has the look of well-cultivated weeds. Nearby I saw several groups of workmen taking a quick break before they returned to upgrading the interiors of their vastly wealthier paymasters, and seemingly in no hurry to get back. Strictly speaking, 51.5°N only scrapes the pavement outside the northern tip of Harrods, but anyone standing here would immediately have their eyes drawn towards the adjacent world-famous department store. Door 6 leads into the lipstick room, just before the handbag hall, each offering far more luxurious varieties than anyone might rightly need. A lot of those swanning inside are tourists from the wealthier end of the scale, their numbers boosted by the weak pound, very likely wearing sunglasses, and often designer headscarves or gold-threaded shawls. The next entrance along Hans Crescent has been converted into a fake bullion vault, because that thrills the clientele, and the commissionaire is only too happy to step out and take a grinning family snapshot. Back on the corner, a young busker with an electric cello is sitting on an amp and wowing the crowds. He starts with a familiar tune I eventually work out is Ed Sheeran, then smiles and segues into Hallelujah - a not-especially Leonard Cohen version. The circling crowd is enthralled, and appreciative, perhaps inspired by the handwritten sign 'Saving Up For Music College'. 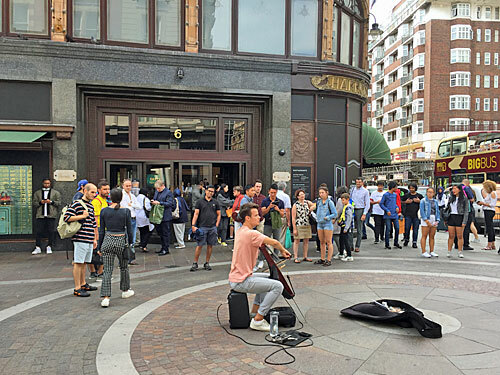 With admirable frequency audience members step forward and drop notes and coins into his case, not necessarily in the local currency, helping towards his three year overdraft. I suspect this is one of the primest pitches in London, although I wonder quite how long your performance would have to be to save enough for a Christian Louboutin. 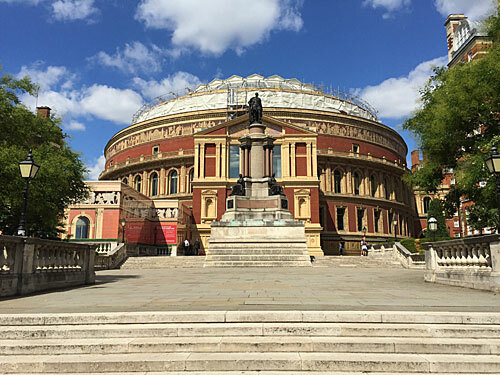 My chosen line doesn't cut the concert rotunda itself, but instead the steps to the south connecting down three flights towards the Royal College of Music. Previously these were the South Steps, but at the turn of the century they were ripped out and rebuilt to accommodate dressing rooms, energy equipment and a loading bay underneath. Today they're the Diamond Jubilee Steps, renamed when HM The Queen officially graced them with her presence, and you'd never guess all that infrastructure was hidden beneath your feet. At the top of the steps is the 1851 Exhibition Memorial, originally intended to be 'Britannia Presiding over the Four Quarters of the Globe', but then Prince Albert died and he got to be the main statue instead. As the key driver behind Albertopolis I guess it's only right. The upper piazza is large enough to cope with scores of Promenaders, including those hanging around for day tickets to the Gallery (£6, first come, strictly 1 each). I decided against hanging around for Prom 43, and also against popping into the Verdi restaurant for tagliatelle al ragù d'anatra or a quattro stagioni. A word of warning if you cycle here, don't leave your bike chained to the railings outside Albert Court because the porter charges £20 to release unwelcome steeds. This is one of zone 1's odder outdoor stations, accessed through a shopping arcade rather than directly from the street. I bet Pret, Nero, Leon and M&S weren't the original vendors immediately outside the ticket hall, but times change. 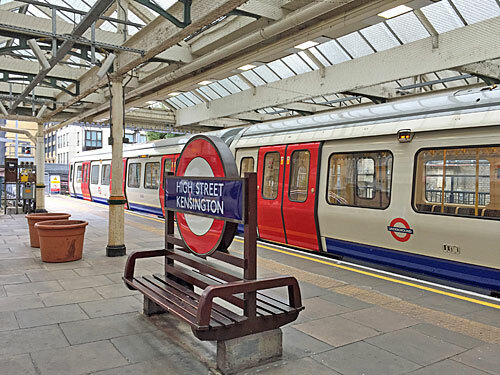 Platforms 1 and 2 are fairly standard, if often thronged, while platform 3 is used by the wilfully downgraded Olympia service. But platform 4 is the true curio, an almost-unused siding accessed down a barely-noticed staircase from the concourse, or via a gloomy crossing behind the buffers of platform 3. I couldn't bring myself to walk down to the far end without appearing astronomically suspicious. Come back on 1st October for the station's 150th birthday party. Formerly the Commonwealth Institute, this is where the Design Museum ended up after fleeing their previous Thamesside home at 51.503°N. The shell of the building survives pretty much intact, notably the copper-covered hyperbolic­ paraboloid roof, but the entire interior was gouged out at the behest of the new owners, and it isn't the same without the central podium and flying staircases. Don't get me wrong, it's a different kind of impressive inside, but walking round again I was struck by how much of the new museum is wasted empty space. Stepping up from the gift shop in the foyer, a set of benches sponsored by Land Rover. Around the central atrium, a string of haute couture photographs as a sop to visitors too poor to pay £16 to see the main exhibition. On several floors, locked doors leading to study zones, education spaces and a dead restaurant. In the basement, a few posters. It could be so much more. It isn't. At least the free exhibition Designer Maker User is always open on the top floor, and that's extremely good, but again crammed into a much smaller space than the building's footprint could allow. I love the wall which shows a century of gadgets shrinking inexorably towards a tiny smartphone. I always stop to pay homage to Kinneir and Calvert's road signs. But having been round before it didn't take me long to wander through, and I barely stayed in the building for half an hour. 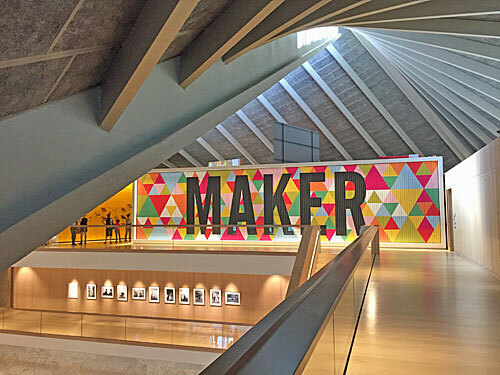 I should've been more appreciative because, looking ahead, the Design Museum's the last building of any familiar stature on 51½°N before the suburbs kick in ahead. A quiet country lane until the mid 18th century, Shepherd's Bush Road became a spine road off which subsequent suburbia grew. It ferries traffic from the apex of Shepherd's Bush Green to the Hammersmith gyratory, and was once wide enough for trams, so feels pretty spacious. They still do proper pubs round here, the local being The Richmond, which retains a beer'n'Sky vibe, and whose food menu consists solely of a well known frozen pizza brand. Elsewhere along the parade, a more gentrified vibe has encroached. The cafe on the corner doubles up as a fitness studio and deli, plus a useful space to park the kids for 'indoor play', while round the back is a candlemaking supplier with a royal warrant. A coach pulls up outside the acupuncture clinic, a shaky-looking luggage trailer tagged on behind. A man with a ponytail dashes out of the dry cleaners and yells up the road towards his shaggier mate. Thames Water are digging up the pavement by the estate agents. Sandbags hold down a metal stand supporting a long-vanished road sign. The off licence that's proved surplus to requirements is plastered with posters for the Shepherds Bush Green Family Funfair. For morning coffee and the Mail, tables out front at the Mustard Brasserie suffice. That window arrayed with with four smart dresses and a pot plant is what passes for a charity shop hereabouts. Inhabitants of the broad Victorian avenues to either side seem well blessed. Aware I'm nipping across the borough too fast, I pause in Benbow Road for a glimpse of how things are. Smart terraces are the order of the day, here generally one floor lower than they were a mile back. These are homes where most residents climb steps to their front door but some descend to a semi-basement, whose front rooms are either cautiously shuttered or open to reveal Sunday-supplement-perfection. Old maps confirm this area was once a hamlet called Cacklegoose Green, which is so brilliant a name you'd think a local developer would have appropriated it, except it seems there's nowhere to be redeveloped. If you're counting, I'm now the same distance west of the Greenwich meridian as I was east when I started out on the edge of Essex. 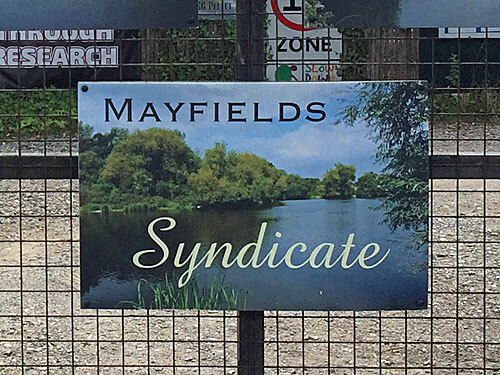 Here's an unfamiliar but genuine place name (as can be confirmed by the spider maps in local bus shelters being titled "Buses from Starch Green"). 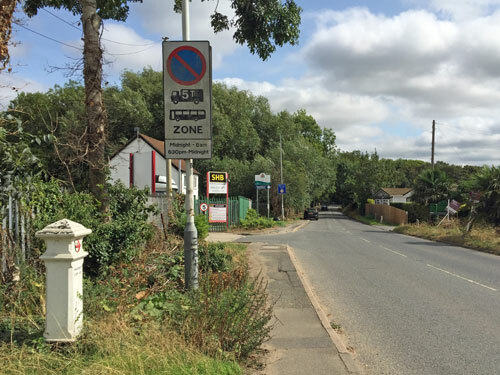 This former hamlet has been almost completely swallowed apart from a scrap of eponymous green beside a pair of mini roundabouts. Once there was a pond here, around which several laundries grew up, hence the name. Today there is still one dry cleaners on King's Parade, but Starch Green's roadside edge has been fenced off to discourage egress, and its benches are better used by pigeons than passers by. I was impressed by the variety of trees, including a thick gnarly plane and a dense pine, and by the council operative cleaning, tidying and generally keeping the garden ticking over. The most obvious landmark is the The Oak W12, or as it was once known The Seven Stars, as evidenced by the name carved into some jaunty stonework above the gastropub's side door. 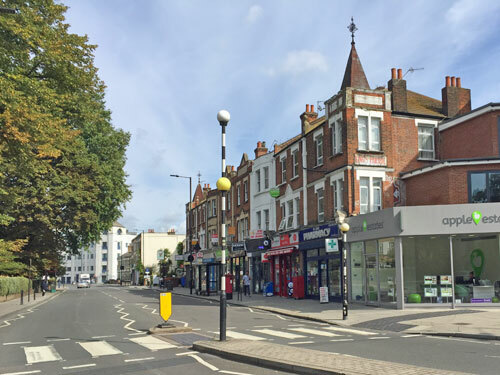 The most unnerving shop name is a hairdressers called Askew Cuts, named because it sits at the foot of Askew Road but come on, would you risk a a restyle in there? Another tonsorial lost opportunity is Ali's & Sons International Gents Hairdressers, which surely would have been better off as Ali Barbers. The most intriguing shop name is Bears Ice Cream Co, who do Icelandic soft scoop, but alas not in the morning when its shutters are down. And apologies, because if 51.5°N had run a fraction further south I could have brought you a report about the top of Ravenscourt Park, rather than a rundown of small businesses on the Goldhawk Road. Hurrah, I thought when I first saw where the line for 51.5°N went, I'm going to Bedford Park. 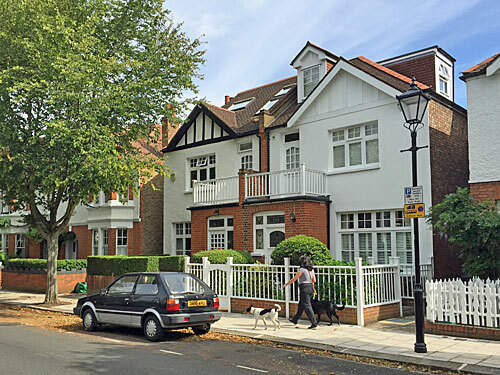 Laid out across fields to the north of Turnham Green station in the 1870s, it's widely seen as the very first garden suburb, or at least the prototype, and I've never blogged about it before. The estate had a troubled start, and grew in a fairly ad hoc manner, but that helped give it character and a genuine leafy feel, and today's residents are no doubt delighted by their housing choice. 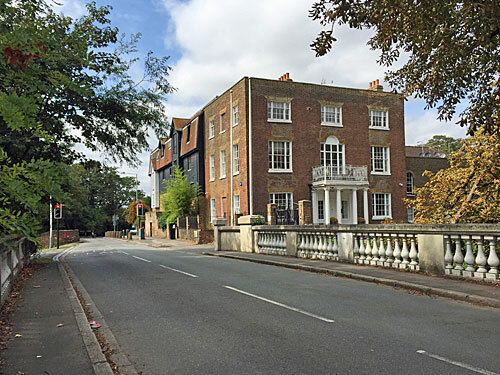 And then I looked at the maps on The Bedford Park Society's website and noticed I'd be skirting the oldest bit, where the 200+ listed buildings are, and passing instead through the fractionally-younger not-quite-original avenues around the perimeter. Hey ho. Abinger Road's lovely, though, a backwater tree-lined street pushed right up against the estate's impermeable boundary. Its houses are varied enough to have real character, with low walls or spruce hedges or more likely a perfect white picket fence along the front. By being built just before the dawn of the motor car these homes have front gardens too narrow to park a vehicle in, which is I think the key to why everything looks so attractive, although it does instead mean endless parked cars along the road. Over in St Albans Avenue the houses are fractionally later still, and a lot terracier and brickier, but still with that late Victorian sparkle. An adorable characteristic is how each house was built from a subtly different shade of brick to its conjoined neighbour, and who wouldn't want a plaster relief cornucopia beneath their upper bay window? You lucky lucky people. Less than half a mile away, the ambience is very different... and we have a station. South Acton's on one of the Overground's quieter arms, hence other Acton stations draw much higher passenger numbers. Because of the way the timetable falls, the allocated member of staff has several minutes between overlapping trains to pop round the back of the ramp for a vape, or to sit on the platform with a Metro. But what's more striking, indeed unmissable, is the housing estate going up alongside. Welcome to Acton Gardens. 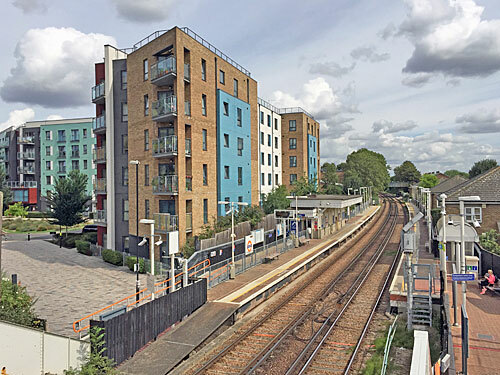 The first block of flats, by the railway, was built on the site of the terminating platform of a minor District line shuttle cancelled fifty years previously. More recent blocks have part-tiled facades in signature colours, possibly so that if you're heading home blind drunk you simply head for the tangerine one, the turquoise one or the butterscotch one. As for the new block perched above the token Sainsbury's Local, this has variegated bricks resembling mottled chocolate, plus golden balconies, and the photograph I took of it looks uncannily like an architect's vision. I think only the Biffa waste bin gives the game away. And it's not finished yet, because Acton Gardens is a massive project involving the sequential replacement of the entire South Acton Estate. I watched as an extendable claw grappled with what was once the balcony of a maisonette on the tenth floor of Grahame House, and sent a lifetime of debris smashing to the ground. They'd never knock down Bedford Park and replace it with something more suitably-dense, but pockets of social housing continue to replenish and renew. We had to hit another park eventually, and this one's splendid, and historical, and home to an excellent newly-renovated museum. Fortuitously I blogged about it in June, so don't need to go into enormous detail about it again, plus it turns out the 51.5°N line just misses the main building where the museum is. Instead it hits the so-called Small Mansion, the one lottery money hasn't got round to restoring yet, where the Learning and Curatorial Department hides out behind a woefully peeling porch and faded frontage. Inside are stacks of chairs and tables, and piles of packing boxes, and an office one of whose occupants has a pencil case in the shape of an Egyptian sarcophagus. 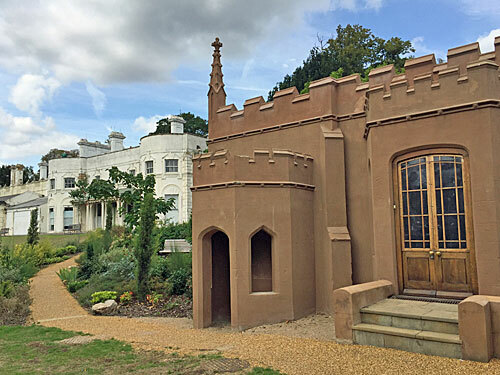 Brilliantly the line also slices through Princess Amelia's bathhouse, a tiny folly containing a flint-walled pool (not generally visible to visitors). The park is wide, and stretches all the way to [51.5°N 0.297°W] (across the boating lake, horticultural college and a huge fenced-off area awaiting transformation into a dual-borough outdoor sports centre). But my eye is particularly drawn to a sign on the very farthest gates, which have been blocked off and clearly labelled 'Project Kiss'. Another sign on the adjacent footpath apologises on behalf of "work for Secret Group", and a separate map displays the full restricted area ("for further information, please get in touch with communications@secretgroup.com"). It's an open secret that this summer's sold out Secret Cinema event is Baz Luhrmann's Romeo + Juliet, but officially nobody is supposed to know quite where it's being held. As a posh charcuterie van rattles across the grass, and staff unlock the barrier to let it out to fetch fresh meat for tonight's fancy dress hordes, my lips are sealed. Places on the 51½°N parallel outside London: Slough, Bristol, Cardiff, southern tip of Ireland, mostly-uninhabited Canada, one of the Aleutian Islands, Russia, very-northern China, Russia again, Kazakhstan, Ukraine, Poland, Germany (Dortmund), Netherlands (Eindhoven), one Belgian village, Thames Estuary, Thurrock Thameside Nature Park, North Stifford, Aveley.